First of all the Arabian is the oldest purebred in the world. In fact, they are the foundation horse for popular recreational breeds such as Thoroughbred, Quarter Horse and Morgan. They are intelligent, easy to train, and enjoy human companionship. Some consider the Arabian the most intelligent of all breeds of horse. Its shield-like bulge between the eyes, called the jibbah is said to allow for greater brain capacity. The Arabian possesses a long memory, quick comprehension, alert curiosity, resourcefulness and sociability. Centuries of close relationships with humans have given Arabians a friendly, loyal disposition, marked by a desire to please their master. They enjoy playing with people as much as horses. 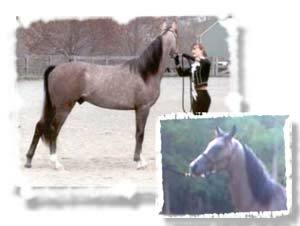 The Arabian also consistently lives out other breeds. Most Arabians are in their prime at 20, and many live well past 30. Fire is a 1997 Chestnut who is sweet enough to be used as a child's lesson horse. With names like Bay El Bey++, Bay Abi++ and Gwalior++ in her pedigree, as well as double lines to *Bask++ this mare has the conformation and personality to create beautiful foals. We are very much looking forward to our next breeding season with her. 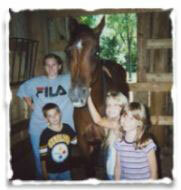 There is something to say about a horse when four kids can pose for a picture with her in her stall. She just started training in 2001 and has done well enough to be ridden by a novice and place in an "A" show. With lines to *Aladdinn and *Bask++ she should produce some showstoppers.